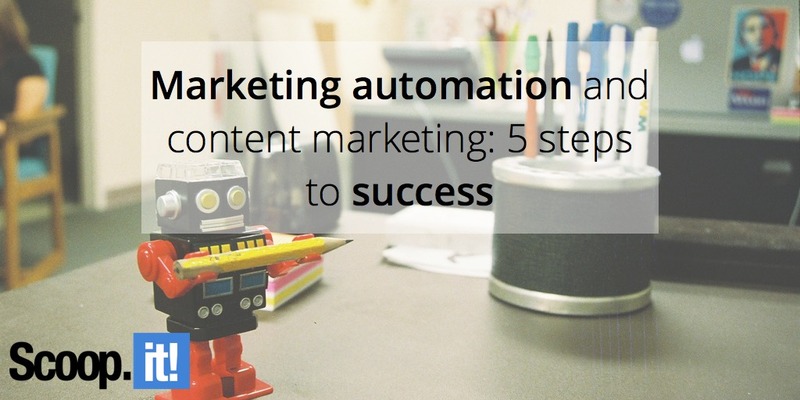 Marketing automation and content marketing: 5 steps to success. These five steps help take the mystery out of one of digital marketing’s most profitable pairings – content marketing and automation. Content Marketing is – or should I say must be – used by most marketers as part of their digital strategy: 88% of B2B marketers use it to generate traffic, leads and revenue. However, it is still complicated for a lot of them to clearly see how Content Marketing and Marketing Automation softwares can work hand-in-hand to produce more, and better. The very first thing is to understand your prospects’ pain points. Marketing automation tools will help you to understand the way your audience interacts with your content, thanks to a couple of metrics. Once you’ll be able to demonstrate how your product or service solve a problem to your prospects, the conversion process will start. Example: Track the performance of your ‘how-to’ blog posts to understand the common problems and the key topics of your audience. Step 2: Don’t forget your buyer personas! You got to be aware of the buyer personas you’re talking to. Marketing expert Wasif Kasim defines them as “a way of distilling your knowledge of your customer base into imaginary ‘model’ customers”. Therefore, your content has to be personalized through buyer research. Marketing automation will help to guide your soon-to-be customers throughout the sales funnel, and the content you deliver has to be diversified enough to meet all needs. This is what lead nurturing is about, and it is an important part of the marketing automation process. Doing this will build credibility and trust with your brand, and help the sales team to follow-up. As said earlier, prospects’ expectations differ depending on where they are in the sales funnel. Delivering the right and appropriate message at each stage of that funnel, through your content strategy, is called content mapping. Top of the funnel content (ToFu): It refers to content that speaks to prospects that are new to the brand. Awareness or engagement content. Middle of the funnel content (MoFu): This the consideration stage for your prospects. They are likely to be researching information about your competitors and make comparisons. At that stage, content must be information-heavy – one great example is the use of case studies. Bottom of the funnel content (BoFu): At that stage, prospects expect content that adds value to their purchase. They need content that helps them get the most out of your product or service. How-to guides and helpdesk articles are great examples of BoFu content. Implementing a lead scoring system will then give you a clearer vision of your sales-ready leads – they are scored based on the interest they show in your business. “For example, if a person visits your website, it could be measured as one point. If that visitor visits a page with case studies, it could add another five points, and if he or she clicks on a CTA button, it adds another few points. Totalled, this visitor’s behaviour patterns arrives at a score which quantifies how ready he or she is to be contacted by a member of your sales team.” says Wasif Kasim. The content strategy you set up is an on-going process, and should evolve in line with your customers’ behavior changes over time, new product launches, new market opportunities etc. OK, so now you are all set to start producing more and better content thanks to Marketing Automation. It is therefore the right time to include more technology to the process of content creation and introduce a different kind of automation. The intelligent content marketing automation doesn’t help marketers go faster but also helps them work smarter. It consists of technologies that are capable of making or even implementing relevant recommendations to improve a company’s content performance by combining analytical data, publishing history and artificial intelligence algorithms. 1. To be systematic in applying best practices of content marketing. 2. To create better content for your audience. 3. To optimize content performance over time. 4. To understand better the value and ROI of content. That’s it! The mystery of Marketing Automation and Content Marketing has been solved, and you are finally ready to start implementing these 5 steps in your content strategy. To go further, make sure to consider leveraging the power of content marketing and artificial intelligence technology, in order to work faster and smarter. Want to start generating real results from your content marketing? Find out how to use the new Scoop.it Content Director to help you become a smarter marketer! 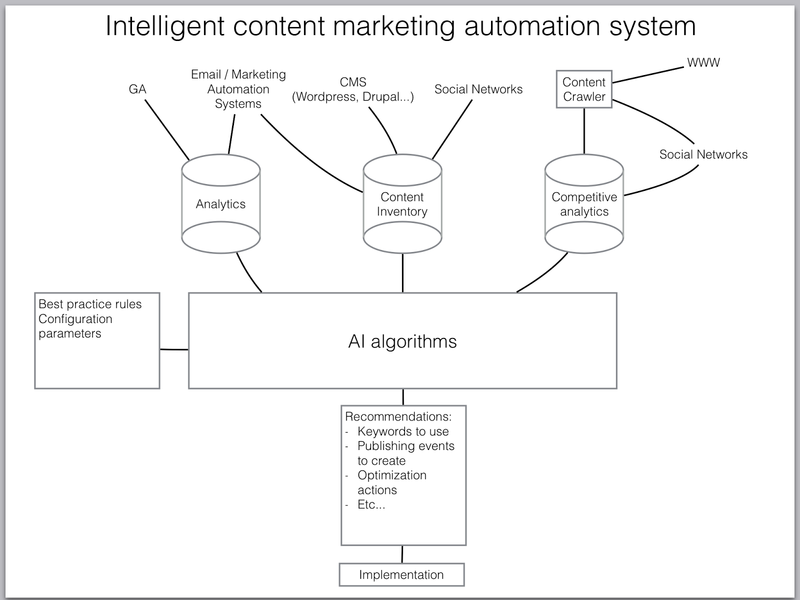 1 Comment on "Marketing automation and content marketing: 5 steps to success"
Thank you for this article and putting an emphasis on the intelligent content marketing automation. It’s particularly important to gather plenty of information about clients before setting up any campaign. Personas are very useful, but what if you know what real people do online (website/mobile app) and offline, e.g. in the shop (yes, it’s possible!) in order to create scoring, customer journey, recommendations and advanced campaigns? And not every marketing automation tool is able to to that, on the contrary. That’s why I’d like to recommend Synerise, which uses a state of an art technology to generate ROI.